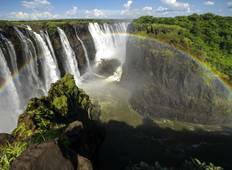 Find a Wildlife trip that explores South Africa And Zimbabwe. There are 44 tours to choose from, that range in length from 3 days up to 26 days. The most popular month for these tours is November, which has the most tour departures. "It was wonderful trip, with professional guides and they choos very nice places,..."
"Had a fantastic trip from Vic Falls to Johannesburg with the guide Simon. Car in..."